The opening game of the round saw Brunswick take on Regent City in a must win for both sides who had one win a piece so far this season. It was Regent who got the better start as they forced a turnover before Shifa Ahmed rifled his effort home, with the aid of a deflection for the opener. 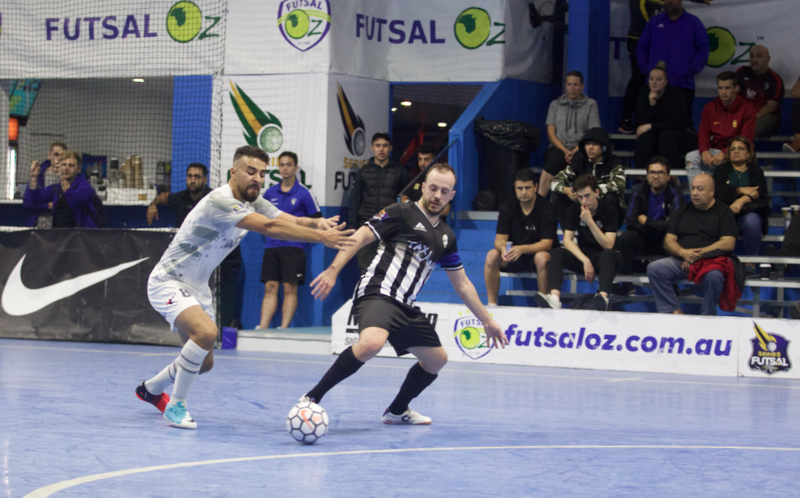 It was two when a mix up at the back saw Zaccone turn one into his own net, and when Kevin Lam beat his man and finished, it was 3-0 and Brunswick were in a lot of trouble. Some more slick play from Regent saw Abdirizak Ahmed tap home to make it four and just before the break, Osman Ahmed fired home a free kick to have his side 5-0 ahead at the break as it threatened to be a blowout in the second half. Regent had taken their foot off the gas and Brunswick managed to get on the scoresheet through a Simone Pelletti strike to give his side a slim hope of a come back. When an own goal went in off keeper Douglas Lindberg, Brunswick would have hoped they were turning the tide. That was as close as they would get though and when debutant Ali Al Sharani tapped home at the back post, the win was sealed for Regent as they got their second victory of the season. 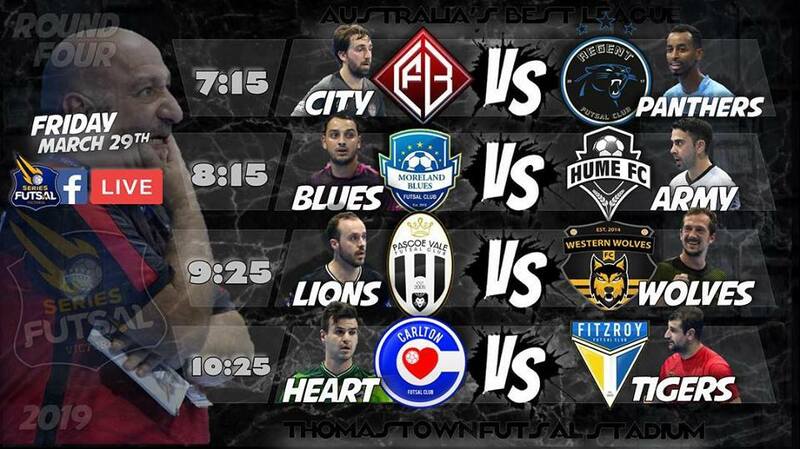 Next up saw old rivals Moreland and Hume go head to head, with both desperate for the three points. It was Moreland who took the lead early through an Adam Cooper strike, but Hume pulled level soon after through an Anthony Brown goal from a corner. Mario Petrovic then found the net on his left foot to give Hume the lead, and soon after a well worked set piece saw Konrad Machoy turn the ball home for a two goal buffer. 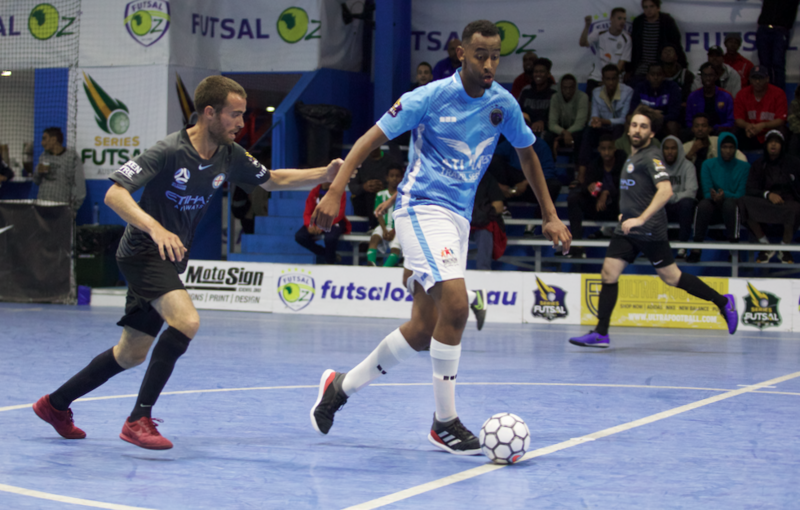 Moreland hit back through Ruz Roslan who lashed home on the turn and Moreland found themselves level before the break with former Hume player Muhammed Temel cutting inside and firing home to have the scores locked at three. Moreland stepped it up a gear in the second half and were far too good as they ran over the top of their opponents, bagging five unanswered goals, with Temel bringing up a hat trick against his former side, while Hirose, Vaz & Korkmaz also got themselves on the scoresheet, as Moreland remain unbeaten after four rounds. 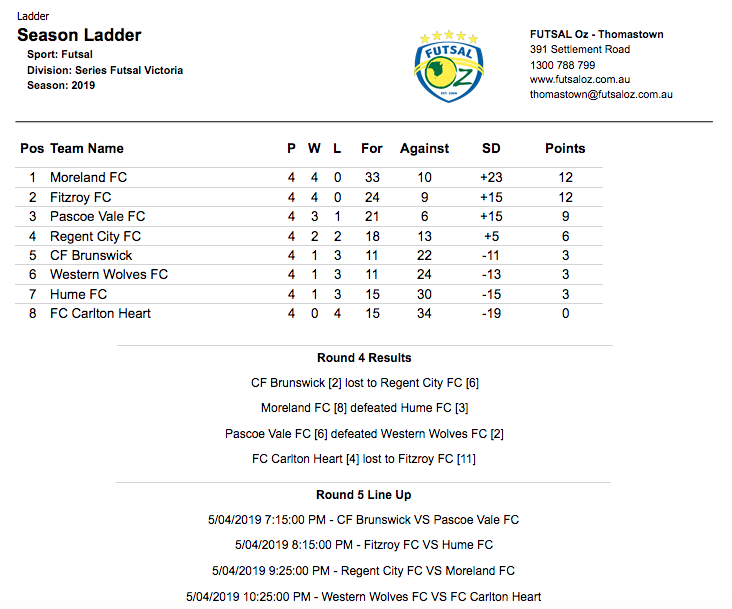 Next up saw Pascoe Vale take on Western Wolves as both sides were in need of the three points to set up their season. It didn’t take long for the Lions to open the scoring as Andre Caro roofed an effort from a side ball to give his side the lead, and Caro then turned provider as he played Alejandro Gomez who backheeled home for the second. Caro then found the net once again as the game looked like it would be a blowout. 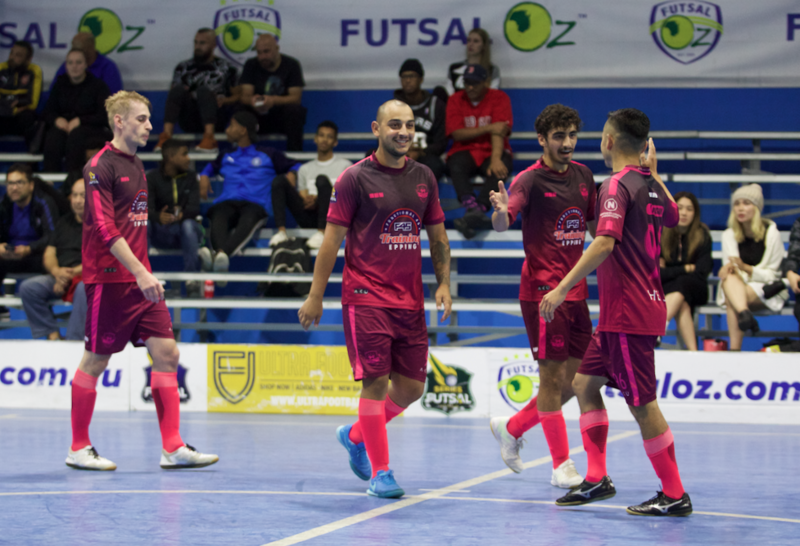 The Wolves pulled a goal back through Rodrigo De Faria who converted at the near post to keep his side in the contest, and were within a goal when Reza Zanfouri found the net after rounding up Felipe Bley to go into the break within a goal. The second half began very even with both sides making chance, but it was Pascoe who found the next goal as Sinan Gluhak hit the upright, before the ball fell to Tyler Garner to finished to put his side two up. Alejandro Gomez then found Caro at the back post to tap home and all but seal the game. A late goal to youngster Jake Besenyi sealed the win as the Lions ran out with a 6-2 win. The final game of the evening saw Carlton take on current champions Fitzroy in what is always a tight contest. It was the Heart who got off to the better start when youngster Connor Irwin found the net to give his side the lead, and it was soon two as Rico Hauser struck to double the Carlton lead. Jose Filho pulled a goal back before the break, but on the half time whistle, Syahmi Sarip found the net to have the Heart two up at the break. Early in the second half Fitzroy pulled a goal back through through Corey Sewell to keep his side in it, but the Heart again extended their lead as Chaaban Rajab’s strike hit the post before going in off Peter Tamburrino for an own goal. Fitzroy pulled another back as Scott Rogan lashed home from a tight angle, and the Tigers were level when Rogan turned provider for Tal Galper to tap home. Fitzroy then went ahead for the first time on the night as Galper beat his player and finished, and the Tigers were two up when Cosimo Russo converted from a side ball. From there the Tigers ran away with it as a ten meter penalty was saved but put in by Filho on the follow up, before Ben Monteleone turned his player and cut it back for Scott Rogan to net. Late goals from Russo, Galper and Monteleone put some polish on the result as Fitzroy survived an early scare to record a big win.